Last week, in the wake of the Peshawar church bombs, minority Pakistani Christians staged protests and demonstrations across the country, angry at the lack of protection given to them by their government. The protests themselves produced more violent attacks, in some cases apparently provoked by political and radical Islamist groups. In Pakistan’s largest city, Karachi, at the other end of the country from Peshawar, a Muslim man was killed, at least 17 houses set on fire and dozens of others ransacked and looted, in a majority Christian area. Around 300 Christian families fled their homes in the Michael Town area of the city following the violence on Sept. 23, the day after the deadly bombings at All Saints Church in Peshawar. Three Christians – Yasir, Harry and Waqas Masih – were charged with the murder of Mazhar Iqbal, a Muslim. Three others – Ubert, Ilyas and Babar Masih – were charged with desecrating a local mosque. No charges have been filed against the Muslims involved in the violence. ‘Masih’, which derives from ‘Messiah’, is a common name among Christians in Pakistan. 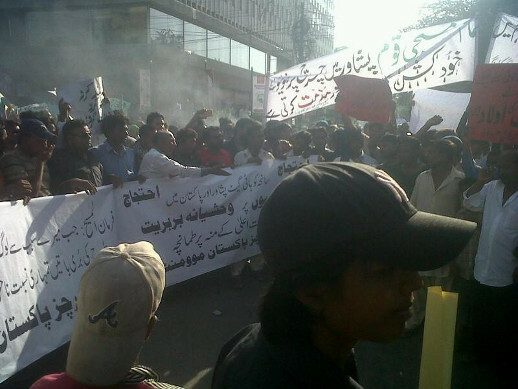 The Karachi protests had begun around midday, after Christians told shopkeepers in the area to shut their businesses, as is the custom before a demonstration. On their way back to Michael Town, Ubert, Ilyas and Babar Masih were accused by local Muslims of pelting the Khulfa-e-Rashdeen Mosque with stones, breaking the mosque’s sign and spitting at it. The trio were called into the mosque to apologise, which they did. As they exited, around 150 Muslims were waiting for them, according to David Rehmat Sher, pastoral administrator at St. Seraphim’s Russian Orthodox Church. “The Muslims had a different plan on their minds, and were armed with sticks, iron rods and stones,” he said. However, Pastor Imran John of the Philadelphia Pentecostal Church said the Christians had committed no offence. “It is almost impossible that Christian demonstrators could have desecrated the mosque because demonstrators went to the Double Road, while the road from the mosque leads to the seaside – not the road chosen by the demonstrators,” he said. Police spokesman Sarfraz Gondal said the riots were political and had nothing to do with religion. Emmanuel Masih, 21, a resident of Michael Town, told World Watch Monitor he was at home when a group of Muslims attacked the colony. He said his family locked the door from the inside and went up to their rooftop. Eventually, the men broke into Masih’s house and started to set fire to the family’s possessions. “My mother went down and begged the attackers not to harm the household belongings, but they beat her and even burned all the dowry articles of my sisters,” he said. The attackers then cut the electricity connections to the colony so that they could not be identified in the evening light, said Masih. Masih said they waited on the neighbouring rooftop and watched their home burn to the ground. Hamida Bibi, another resident of Michael Town, told World Watch Monitor that they had heard that the hospital staff had received a threat that if they treated Christian patients they would be attacked. Another victim, William Masih, told World Watch Monitor that he hid himself and his 13-year-old son in a large automobile trunk to shield them from the attackers. “After a little while we began losing consciousness but thanks to God, a team of journalists by chance opened the trunk and sent us to hospital after finding us unconscious,” he said. Several people jumped into water reservoirs to hide from the attackers, waiting for the police to arrive some three hours later, said Pastor John. “By then at least five houses were burned to ashes, another 12 were partially burned and scores were ransacked and looted,” he said. Pastor Sher said there was no access to the colony so the exact damage could not be assessed. Earlier reports suggested that the assailants also broke the doors and windows of the Philadelphia Pentecostal Church of Pakistan, the Catholic Church and the Baptist Church, and pelted them with stones. However, Pastor Sher and the police spokesman said no church had been attacked. The police spokesman added that no complaint had been lodged against the Muslims. Mushtaq Mattu, President of the Pakistan People’s Party in Karachi, told World Watch Monitor that he had a meeting with the government’s chief minister on Saturday to discuss the violence. “The chief minister ordered the commissioner of Karachi East that all Christians be brought back to their homes with all due respect and the government must compensate the affected families,” he said. He said another meeting with the deputy commissioner had taken place on Sept. 29. “The deputy commissioner has assured that tension in the area will be resolved within a couple of days and then Christians will be able to peacefully return home,” Mattu said. Pastor Sher added that around 300 families have been left homeless and are now staying with relatives or in churches. Former National Assembly member Javed Michael, after whom Michael Town is named, said police were still patrolling the colony and that territorial disputes over the area were longstanding. “The Michael Town tensions will resolve only when ‘outsider involvement’ ends, which is going on because this is an expensive land area,” he said.